His family and all he has ever known left behind. Will Myles fulfill his wizard destiny and save the world or lose more than ever before? Waking up in an entirely new world, Myles is forced to trust a complete stranger who claims he is destined to become a great wizard. Under the mentorship of Alfaron he begins his training as a wizard apprentice. But dark secrets lay hidden in the shadows of the land known as Lavantala. When evil is re-awakened Myles is faced with an ultimate challenge- save his newfound friends and home or perish to the evilest of sorcerers. Readers who enjoyed classics such as J.R.R. Tolkien’s The Hobbit and J.K. Rowlings’ Harry Potter series won’t want to miss out on this exciting new magical adventure. Filled with intricate spells, ice-breathing dragons, and battling wizards- readers have trouble putting this book down. 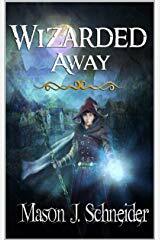 Get your copy today and you might find yourself getting Wizarded Away into a whole new world! Next Post Pre-Order Al Moreno: Rift Resolver Today!